Discover gastropub cuisine at chef Brendan Collins’s out-of-the-way Culver City restaurant. : Brendan Collins has had some serious training, including under chef Marco Pierre White at Quo Vadis in London. Then he moved to Los Angeles, and worked at Mélisse, Anisette Brasserie, and The Hall at Palihouse before deciding to open his own restaurant with partner/general manager Carolos Tomazos. The pair took over a diner in the middle of nowhere in Culver City, but it’s worth finding. 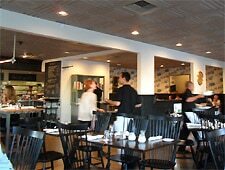 They revamped the place but kept the diner feel, which works to their advantage, though they don’t need much help due to Collins’s serious culinary skills. The rather low-key décor belies the quality of his dishes. The British chef has successfully created a gastropub menu, where pretty much everything is good (except the pizza, which, after all, is Italian). Everything else is so uniformly good that your choices should only be dictated by your particular cravings at the time of your visit. Be on the lookout for intriguing specials. Don’t start eating too much of the delicious house-made bread, and save room for the “King platter” to discover the house-made charcuteries, like rabbit and pistachio terrine, cured meats and sausages. The rendition of Collins’s Caesar salad is so interesting that he should never remove it from the menu. When it is in season, don’t miss the grilled peach salad and burrata before moving on to the shepherd’s pie with buttered seasonal vegetables. The sweets are just in perfect harmony with the savories. Indulge yourself with the sticky toffee pudding or the chocolate panna cotta with butterscotch mousse. The wine list is short, but there is a quality beer list befitting a gastropub, including offerings from North America, Europe and Brazil. Enjoy a glass at the busy bar or in The Wreck Room, which is decked out with a pool table and dart board.